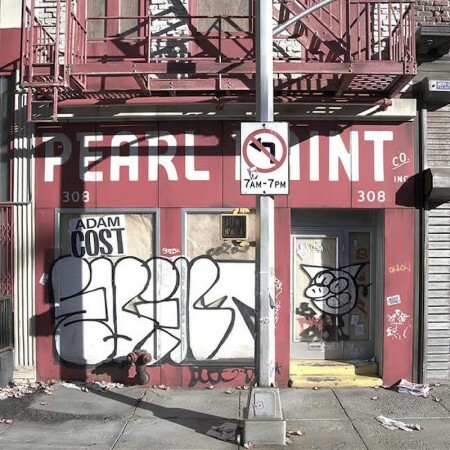 Los Angeles-based artist Randy Hage has been photographing New York City storefronts for nearly 20 years. Since the late 1990s, he’s amassed more than 700 photos from which he’s sourced the subject matter for his amazingly detailed photorealistic sculptures that depict mom & pop establishments, each of which retains an iconic symbolism representative of generations past. More than half the establishments that Hage has photographed have either moved or been lost to gentrification. This and commercial exploitation render his work a true testament to New York City’s rich history which once comprised a much more vibrant and culturally diverse metropolis where the characteristics unique to each neighborhood clearly distinguished one from another. Recognizing the rapid proliferation of chain retailers and restaurants on most every block, Hage was compelled to recreate old storefronts in an attempt to emphasize the radical change that has forever changed Manhattan’s topography. To this day, Hage continues to visit New York twice a year. But he’s recently found it necessary to extend his exploration to the city’s boroughs where a handful of stores still retain a semblance of the city’s mid-century charm with their hand painted signs and original hardware. With 25 years experience in the film industry, building sets and fashioning props, Hage is well armed with an arsenal of inventive techniques and applications that allow for his uncanny ability to replicate his subjects with exacting precision. More so, his innovative talent for adapting and repurposing basic materials is what enables him to produce such truly complex and delicate details that decorate each and every one of his sculptures, scaled to 1/12 their original sizes. Façade, the artist’s third solo show with Flower Pepper Gallery in Pasadena, is the culmination of two years’ work creating the nine pieces on display now through November 18th. 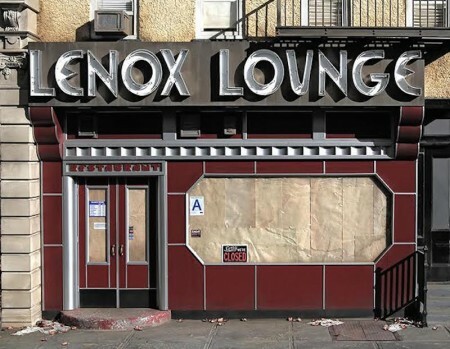 One particular sculpture that conveys New York’s ever-morphing landscape is “Lenox Lounge.” Opened in 1939 by Dominic Greco, the Harlem bar established itself as a legendary venue for jazz greats such as Billie Holiday, Miles Davis, and John Coltrane. While Lenox Lounge remained open for seventy-plus years, the growing influx of young professionals who’ve migrated into the area and have thus contributed to the exponential rise in rents forced its eventual closure in 2013. Hage’s delicate attention to the historic venue’s Art Deco signage and architectural flourishes invoke the celebratory zeal once enjoyed during the club’s glory days. Concurrently, his depiction of brown paper, taped across the club’s front windows, doesn’t only denote the venue’s closing but spurs nostalgia for an epochal era long gone. Another iconic music venue in Façade is “CBGB.” Opened by Hilly Kristal in 1973, the notorious East Village nightclub provided a launching pad for bands such as The Ramones, Television, Blondie, and Talking Heads. Patti Smith, one of the most influential musicians to play on its stage, performed the last and final set before the club’s closing in 2006. Hage’s rendition of CBGB provides an amazingly minute depiction of the club before it was transformed into an upscale boutique. Additionally, and perhaps more importantly, it pays tribute to the club’s formative power as a dedicated proponent of punk rock and new wave. 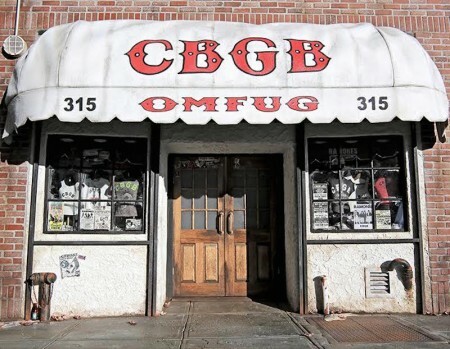 Of the many acutely observed details is a sundry of tee shirts, each of which has been printed with the CBGB logo, and all are on display in the storefront’s window. Along the top edge of the nightclub’s weathered wooden doors appear various tattered band stickers. And next to a fire standpipe stands a discarded beer bottle, partially obscured by a few fallen leaves that add a bittersweet reference to the inevitable passing of time. Pearl Paint is the subject of another of Hage’s sculptures. A revered local arts supplier, its presence on Canal Street helped foster SoHo’s transition in the late 1960s and into the 1970s from an industrial wasteland to a thriving artistic community. Clearly representative of New York’s changing demographics, Hage’s depiction of the recently closed retailer includes a graffitied storefront and an unkempt sidewalk, littered with newspapers and miscellaneous trash. Not every storefront featured in Hage’s series has closed. 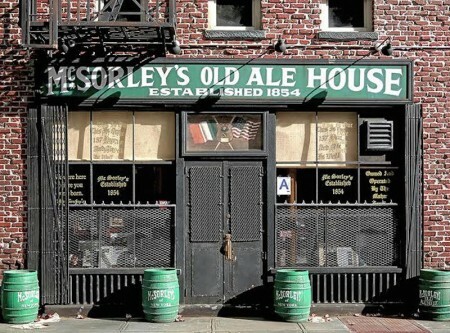 McSorley’s Old Ale House, established in 1854, is the oldest known Irish pub in New York still open for business. Described by e.e. Cummings as a “snug and evil” saloon, the East Village establishment has a deep and rich history along with a distinguished roster of past patrons who vary from Abraham Lincoln and Ulysses S. Grant to Woody Guthrie and Hunter Thompson. The intricacies in “McSorley’s Old Ale House” are especially impressive: clearly legible calligraphic lettering appears on its windows; the storefront’s gate is embellished with microscopically small fleur de lys; and cigarette butts, measuring no more than two millimeters in length, sit wedged between the cracks in the sidewalk. There is no doubt that Hage has cultivated a deep appreciation for New York. His work reflects a genuine affection for the many memories that lie behind each storefront he recreates. Hage’s drive to preserve a historical narrative of the city isn’t only demonstrative of his melancholia for the loss of New York’s original character, but it also serves as a much needed warning for the consequences that unrestrained development, homogenization, and commercialization continue to pose.